For other uses of "Whitchurch", see Whitchurch (disambiguation). The town is bounded by Davis Drive (York Regional Road 31) in the north, York-Durham Line (York Regional Road 30) in the east, and Highway 404 in the west. The southern boundary conforms with a position approximately 200 metres north of 19th Avenue (York Regional Road 29), and is irregular due to the annexation of lands formerly part of Markham Township in 1971. Between 2011 and 2016, the town grew 21.8%, making it the second fastest growing municipality in York Region. The number of private dwellings jumped from 7,642 in 2001 to 15,712 in 2016, with an average of 2.9 people per private dwelling. The town projects a total population of 55,800 by 2021, and 60,600 in 2031, with 97% of the growth within the urban boundaries of the Community of Stouffville. Future growth is governed provincially by the Oak Ridges Moraine Conservation Act (2001), the Greenbelt Protection Act (2005) and the Places to Grow Act (2005). The intent of these statutes is to prevent urban sprawl on environmentally sensitive land and to accommodate future growth in approved settlement areas only. Consequently, Whitchurch–Stouffville's future growth is planned as "sustainable development", largely within the boundaries of urban Stouffville alone, which reflects the vision of "small town tradition between the country and the city". The Town of Whitchurch–Stouffville consists of several distinct communities and the intermediary countryside. The largest urban area is the community of Stouffville proper (2016 pop. 32,634), while other communities in the larger town include Ballantrae, Bethesda, Bloomington, Cedar Valley, Gormley, Lemonville, Lincolnville, Musselman's Lake, Pine Orchard, Pleasantville, Preston Lake, Ringwood, Vandorf, Vivian, and Wesley Corners. The oldest human artifacts found in Whitchurch Township date back to 1500 BC and were found in the hamlet of Ringwood (now part of urban Stouffville). Prior to the arrival of Europeans, two Native trails crossed through what is today Whitchurch–Stouffville. The Vandorf Trail ran from the source waters of the Rouge River to Newmarket, across the heights of the hamlet of Vandorf, and the Rouge Trail ran along the Rouge River and northwest from Musselman Lake; both were part of the aboriginal and Coureur des bois trail system leading through dense forests from Lake Ontario to Lake Simcoe. The territory was the site of several Native villages, including Iroquois settlements around Preston Lake, Vandorf, and Musselman Lake. In 2003, a large 16th-century Huron village was discovered in Stouffville during land development; approximately 2000 people once inhabited the site (Mantle Site), which included a palisade and more than 70 longhouses, yielding tens of thousands of artifacts. In 2012, archaeologists revealed that a European forged-iron axehead was discovered at the site--"the earliest European piece of iron ever found in the North American interior." Other significant late precontact Huron village sites have been located to the south-east (the Draper Site on the Pickering Airport lands) and to the north-west of urban Stouffville (the Ratcliff or Baker Hill Site on Ontario Highway 48, and the Old Fort or Aurora Site on Kennedy Road). The western end of Whitchurch and Markham Townships was purchased by the British crown from the Mississaugas of the New Credit First Nation in 1787 as part of the Toronto Purchase. Whitchurch Township was created in 1792 as one of ten townships in York County. It was named in honour of the village of Whitchurch, Herefordshire in England, where Elizabeth Simcoe (wife of Upper Canada Lieutenant Governor Sir John Graves Simcoe), was born. The first European settlements in Whitchurch Township were established in the 1790s, though Whitchurch and large areas of southern Ontario were only ceded by the south-Central Ontario Mississaugas in 1923. Between 1800 and 1802, John Stegman completed a survey of the township which created a system of land concessions. This allowed for the organized distribution of land to settlers, with each concession containing five, 200-acre (0.81 km2) lots. This layout remains visible today, as the road network in the area reflects the locations of the boundaries between concession blocks. Early settlers of this period included Quakers and Mennonites—two pacifist groups from the nearby American states of Pennsylvania, Vermont and New York. Both groups were seeking religious freedom, and were identified by the Upper Canadian government as people with necessary skills and abilities for establishing viable communities that could, in turn, attract others to settle in the region. Mercenary German Hessian soldiers, like Stegman, were also granted land in Upper Canada by Britain in exchange for their service in the American Revolution against the 13 Colonies. Many of the first settlements in Whitchurch Township were developed at the intersections of main roads throughout the township and /or near streams where mills could built to process the timber cleared from the land. Stoufferville was one such hamlet that grew around the saw and grist mills of Abraham Stouffer, a Mennonite who with his wife Elizabeth Reesor Stouffer came from Chambersburg, Pennsylvania in 1804, and acquired 600 acres (2.4 km2) of land. Elizabeth's brother Peter Reesor established what is today Markham, first called Reesorville. Fifty-five more families from Pennsylvania, mostly Mennonite, arrived in Stoufferville in the next few years. Stouffer's sawmill was in operation by 1817 on Duffin's Creek on the Whitchurch side of Main St., and by 1825 he had a gristmill across the street on the Markham Township side of Main St. as well. In the early 1830s, the old Stouffville Road was carved through largely virgin forest to connect York (Toronto) with Brock Township; a post office was opened in 1832 and the name Stouffville was standardized. In 1839, a new resident from England noted that Stouffville still had "no church (other than the Mennonite Meeting House in neighbouring Altona), baker, or butcher," though "saddlebag [Methodist circuit] preachers sometimes arrived and held meetings at the schoolhouse." Nonetheless, Stouffville was considered a centre "of Radical opinion," one of the "hotbeds of revolution," and it was here that William Lyon Mackenzie set forth his plan for the Upper Canada Rebellion of 1837–38. The hamlet of Stouffville grew rapidly in the 1840s, and by 1849, it had "one physician and surgeon, two stores, two taverns, one blacksmith, one waggon maker, one oatmeal mill, one tailor, one shoemaker." The population reached 350 in 1851, 600 in 1866, and 866 in 1881, with a diversity of Mennonite, Methodist, Presbyterian, Episcopal, Baptist and Congregational places of worship. In 1869 Ballantrae had a population of 75, Bloomington 50, Gormley 80, Lemonville 75, and Ringwood 100. In 1876, there was a regular stage coach connection from the hamlet of Stouffville to Ringwood, Ballantrae, Lemonville, Glasgow, Altona and Claremont. In 1877, Stouffville became an incorporated village. Stouffville's growth was aided by the establishment of the Toronto and Nipissing Railway, built in 1871, which connected Stouffville and Uxbridge with Toronto. In 1877, a second track was built north to Jackson's Point on Lake Simcoe. These connections were created in large part to provide a reliable and efficient means of transporting timber harvested and milled in these regions. Soon Stouffville Junction serviced thirty trains per day. During this time of prosperity, Stouffville businessman R.J. Daley built a large music hall, roller-skating rink, and curling rink. In 1911 Stouffville had a public library, two banks, two newspapers, as well as telephone and telegraph connections. Intensive forestry in Whitchurch Township led to large-scale deforestation, eroding the thinner soils of northern Whitchurch into sand deserts; by 1850 Whitchurch Township was only 35 percent wooded, and that was reduced to 7 percent by 1910. The Lake Simcoe Junction Railway Line was consequently abandoned in 1927. Reforestation efforts were begun locally, and with the passage of the Reforestation Act (1911), the process of reclaiming these areas began. Vivian Forest, a large conservation area in northern Whitchurch–Stouffville, was established in 1924 for this purpose. This development has helped to restore the water-holding capacity of the soil and to reduce the cycles of flash spring floods and summer drought. In 2008, the town had more than 62²km of protected forest; the forest is considered one of the most successful restorations of a degraded landscape in North America. Yet similar environmental consequences due to increased urbanization were projected in 2007 by the Toronto and Region Conservation Authority as probable for southern Whitchurch–Stouffville (headwaters of the Rouge River watershed) if targeted plantings in this area did not begin quickly. Already in 1993, the Whitchurch Historical Committee warned a new generation of "Whitchurch-Stouffville residents" to be "vigilant to treat trees and forests with respect ... In the 1990s care must be taken so that urbanization and concrete road-building do not repeat the destruction to our forest heritage." Though growth in the hamlets of Whitchurch–Stouffville was stagnant after the demise of the forest industry, the population began to grow again in the 1970s, with development in Metropolitan Toronto and the consequent arrival of new commuters. These developments led to a reexamination at the provincial level of municipal governance. On January 1, 1971, Whitchurch Township and the Village of Stouffville were merged to create the Town of Whitchurch–Stouffville; the combined population was 11,487. The town's southern boundary was also moved four farm lots south of the original southern boundary of Main Street. This land was formerly a part of Markham Township. Whitchurch–Stouffville adopted its coat of arms in 1973 (see information box right). The dove of peace, the original seal of Whitchurch Township, is at the crest, recalling the pacifist Quaker and Mennonite settlers who founded many of the town's communities, including Stouffville. The British Union banner of 1707 pays tribute to the United Empire Loyalists. The white church symbolizes Whitchurch, and the star and chalice come from the Stouffer family (Swiss) coat of arms. The growth of Toronto brought serious ecological problems to Whitchurch–Stouffville. Between 1962 and 1969, hundreds of thousands of litres per month of sulfuric acid, calcium hydroxide, and oil waste were poured into unlined Whitchurch–Stouffville dumps never designed as landfill sites and situated directly above the town's main aquifer. This was followed by years of solid waste from Toronto (1,100 tons per day in 1982). In the early 1980s, a group initially named "Concerned Mothers" found that the miscarriage rate in Whitchurch–Stouffville was 26% compared to the provincial average of 15%, and that the town had a high rate of cancer and birth defects. Though the Ministry of Environment was satisfied that the wells tested in 1974 and 1981 had negligible levels of cancer causing agents (mutagens), the town opposed the expansion of the "York Sanitation Site #4". Only after much grass-roots advocacy at the provincial level was the site ordered to close on June 30, 1983. In 1984 it was reported in the Legislative Assembly of Ontario that PCBs were found in well-water, and that 27,000 gallons of contaminated leachate per day were leaking from the site, threatening ground water quality. With new commuter rail service on the Stouffville Line in the 1990s, the drilling of two deep aquifer wells to secure safer water for a large, new development in the hamlet of Ballantrae in 1996, and the controversial expansion of the York-Durham Sewage System Big Pipe with additional water capacity from Lake Ontario, Whitchurch–Stouffville began a major self-transformation. Not unlike the late 19th century, responsible land and water stewardship, as well as the positive integration of many new residents annually into the community, define the challenges and opportunities for Whitchurch–Stouffville in the years to come. The most significant challenge facing Whitchurch–Stouffville in the coming years, however, is the federal government's proposed development of an international airport immediately south-east of Whitchurch–Stouffville (the Pickering Airport lands). Under the current plan, approaches for two of the three landing strips would be directly above Whitchurch–Stouffville communities: the first over Ballantrae, Musselman's Lake and the north-east corner of urban Stouffville, with planes descending (or ascending) from 535 to 365 metres (with an allowable building height in Stouffville of 43 metres); the second over Gormley and the Dickson Hill area (near the Walmart and Smart Centre). A "Needs Assessment Study" was completed by the Greater Toronto Airports Authority for the federal government in May 2010. After a "due diligence review," Transport Canada released the report in July 2011, which identified the most likely time range for the need of the airport to be 2027–2029, and confirmed the site layout proposed in the 2004 Draft Plan Report. In 2008, 94.4% of Whitchurch–Stouffville residents were either satisfied or very satisfied with the overall quality of life in the Town of Whitchurch–Stouffville. In a major community survey, close to 30% of the respondents described the town as fine, good, nice, great, or pleasant; more than half of the respondents like the community or small town feel, while 46.3% enjoyed the friendly neighbourhoods. The most important municipal issues indicated by residents in 2008 were the need to improve the road system; traffic issues; increasing urbanization and overcrowding; land use development and sprawl; and the cost of living (including taxes and user fees) in the town. Environmental protection, including environmental assessments for new development and natural preservation measures, was identified as matter of high importance by residents, but low on a scale of satisfaction. In the hamlet of Musselman's Lake, 72% of residents in 2009 were concerned about the environmental health of the lake and the surrounding community. In August 2011, the municipal offices were moved into a business park area at 111 Sandiford Drive in Stouffville. At the provincial level Whitchurch–Stouffville is in the Markham-Stouffville electoral district. Since 2018 this riding has been represented at the Legislative Assembly of Ontario by Paul Calandra, a member of the governing Progressive Conservative Party of Ontario. At the federal level Whitchurch–Stouffville is in the riding of Markham—Stouffville. Since the federal election of October 2015, the riding has been represented by The Honourable Jane Philpott, Minister of Health and member of the governing Liberal Party of Canada. The greatest portion of Whitchurch–Stouffville lies on the Oak Ridges Moraine. The moraine consists of knobby hills between 290 and 373 meters above sea level of irregularly bedded layers of unconsolidated sand and gravel (built-up glacial debris) deposited by the meltwater of the Wisconsin glacier some twenty-five thousand to ten thousand years ago. In a few cases the retreating glacier left behind and buried huge blocks of ice which, when melted, created deep, water-filled depressions known as kettle lakes. Preston Lake, Van Nostrand Lake and Musselman Lake are three such examples. The boundaries of Whitchurch–Stouffville contain a watershed divide. Streams and rivers at the top of the Oak Ridges Moraine flow northward into the Lake Simcoe basin, part of the Lake Huron watershed. The southern sections (south of Bloomington Road) make up the headwaters of the Rouge River and Duffins Creek, both of which flow into the Lake Ontario basin. These headwaters include many smaller streams and creeks throughout southern Whitchurch–Stouffville. Their identification and protection, plus reforestation in these area, has been identified as urgent for rebuilding water-capacity in the Rouge River watershed which can off-set the worst environmental impacts (e.g., flash flooding, erosion and ground water contamination) of rapid urbanization. The heavily wooded Vivian Infiltration Area is an environmentally significant hydrological infiltration area that contributes groundwater to the Oak Ridges aquifer complex. The northwestern corner of Whitchurch–Stouffville is outside the moraine and is part of the Schomberg Lake plain, an ancient lake-bed overlain by silts and fine sands. The soil formed over the former lake-bed is well-drained, arable farmland. The southernmost portion of Whitchurch–Stouffville west of Highway 48 lies below the moraine and is a clay-loam till plain. Tree species native to Whitchurch–Stouffville include: American Mountain Ash, Balsam Fir, Bitternut Hickory, Black Cherry, Black Spruce, Bur Oak, Eastern Hemlock, Eastern White Cedar, Peachleaf Willow, Pin Cherry, Red Oak, Red Maple, Red Pine, Shagbark Hickory, Silver Maple, Sugar Maple, Tamarack, Trembling Aspen, White Birch, White Oak, White Pine and White Spruce. In 2012, Whitchurch–Stouffville's forest cover was 28.9%. Whitchurch–Stouffville's water supply system is both groundwater-based with five municipal wells and since 2009 lake-based (Lake Ontario) as well. 5,500 cubic metres of water are withdrawn from the Oak Ridges Aquifer and the Thorncliffe Aquifer daily. Stouffville's well-water is chlorinated for disinfection, and sodium silicate is added to keep iron from staining plumbing fixtures and laundry. Two wells receive additional disinfection through an ultraviolet (UV) system. Three groundwater wells are in close proximity to the settlement area of Stouffville (Main Street, east of 10th Line); consequently 239 "significant drinking water threats" have been identified. Whitchurch–Stouffville has a continental climate moderated by the Great Lakes and influenced by warm, moist air masses from the south, and cold, dry air from the north. The Oak Ridges Moraine affects levels of precipitation: as air masses arrive from Lake Ontario and reach the elevated ground surface of the moraine, they rise causing precipitation. Under the Köppen climate classification, Stouffville has a humid continental climate (Köppen Dfb) with warm, humid summers and cold winters. Because of increasing greenhouse gas emissions, the Ontario Ministry of Natural Resources estimates a 1 degree increase in summer and 2 degree increase in winter average temperatures in the region between 2011 and 2040, and a 0% to 10% decrease in precipitation (compared to averages between 1970 and 2000). Smog producing ground-level ozone is a problem affecting the entire Greater Toronto Area. A major pathway for airborne pollutants flows from the upper Midwest United States and the Ohio River Valley and across southern Ontario and Toronto; key sources are coal-burning power-plants and vehicle engines. On episode days (O3 > 82 ppb), Whitchurch–Stouffville reaches its peak about one to two hours later than Toronto. Smog Advisory Alerts are issued by the Ministry of the Environment when smog conditions are expected to reach the poor category in Ontario. The Greater Toronto Area had 13 smog days in 2008, 29 in 2007, 11 in 2006, 48 in 2005. Between 2006 and 2011 Stouffville's population grew 54.3%, second in the province only to Milton at 56%, and far exceeding the provincial average of 5.7%. In 2011 with a population of 37,210, 29% of residents were immigrants, 81% of whom came to Canada before 2001; the number of visible minorities grew from 4.53% in 2001 to 24.5% in 2011 (the trend is expected to continue through 2031). In 2012–13, 50% of the Grade 6 children in one of the community's newest schools were effectively bi-lingual (i.e., the first language learned at home was other than English), up from 17% in 2008–09. In 2010 the proportion of Whitchurch–Stouffville residents that socialized with people from other cultures on a regular basis was far above the national average. According to the 2011 Census, English is the mother tongue for 73.4% of Whitchurch–Stouffville residents. Immigrant languages with the most native speakers are Cantonese (3.1%), Italian (3.0%), Tamil (2.0%), and Chinese, not otherwise specified (1.8%). Motor traffic is served primarily by Ontario provincial Highway 48, Highway 407, and Highway 404, which are in turn complemented by a network of regional roads that form a grid pattern across the town. In 1994, a plan to connect urban Stouffville directly to Highway 401 via the proposed East Metro Freeway was canceled in large part due to the concerns of residents and the work of the Rouge River activist groups. Whitchurch–Stouffville is traversed by two railway lines: One is Canadian National Railway's primary freight corridor connecting Greater Toronto to Northern Ontario and Western Canada, which is being considered for future GO Transit train service with stations in the communities of Vandorf and Gormley (West). The other railway line, formerly the Toronto and Nipissing Railway, is now owned by GO Transit and hosts Stouffville line passenger service to and from Toronto. This line includes two stations in Whitchurch–Stouffville: the Stouffville GO Station in urban Stouffville, and the line's terminus, Lincolnville GO Station, located to Stouffville's northeast. The York-Durham Heritage Railway also runs historical trains between the station and Uxbridge on summer weekends. Until 2012, York Region Transit (YRT) operated two routes (9 and 15) within urban Stouffville, with connection to the Markham-Stouffville Hospital and other Markham routes. With the 2012 York Region Transit Service Plan, the two routes were merged, and the frequency of direct buses to the hospital YRT transit hub was reduced. In February 2014, a new Route 15 was introduced, connecting Stouffville to Yonge Street in Richmond Hill and to a future GO-Station in Gormley. GO Transit operates bus services in Stouffville, with buses traveling south into Markham and to Union Station, Toronto, as well as services north to the Town of Uxbridge. Despite excellent access to the GO Transit and York Region Transit systems, the two systems are not integrated. In 2011, only 6.9% of working Whitchurch–Stouffville residents used public transit to get to work (compare 14% for Ontario), and only 2.7% walked or cycled to work (compare 3.6% for Whitchurch–Stouffville in 2006, and 6.3% for Ontario in 2011). Excellent public transportation options is an increasingly urgent issue for Whitchurch–Stouffville as the town continues to grow with residents who commute daily to Toronto (see Economy below). The Markham Stouffville Hospital is a multi-site hospital that serves approximately 400,000 people in the communities of Markham, Uxbridge, and Whitchurch–Stouffville. The main hospital site is in Markham, 10 kilometers south of urban Stouffville on Ninth Line, and linked by public transportation from Stouffville. The hospital opened in 1990 and, after a successful $50 million expansion campaign, completed a 385,000 sq. ft. addition and renovation project in 2014. The expanded hospital employs an additional 875 staff and 60 new physicians. Residents in northern Whitchurch–Stouffville live in close proximity to the Southlake Regional Health Centre in neighbouring Newmarket. The York-Durham Aphasia Centre is located in Stouffville's Parkview Village, and is a program of March of Dimes Canada. The Town of Whitchurch–Stouffville is policed by the York Regional Police (YRP) and is located within Number Five District; a new Whitchurch–Stouffville Community Sub-Station was opened at 111 Sandiford Drive in 2014. In August 2010 York Regional Police reported to Whitchurch–Stouffville Town Council that the crime rate in the region was down 7% making it "one of Canada's safest communities." Historic downtown Stouffville offers casual eateries, cafes, pubs, fine dining restaurants, and a variety of boutique stores. Urban Stouffville also has a large-scale format, unenclosed shopping centre anchored by Walmart and Canadian Tire. Stouffville has no regular cinema, however Canadian and international films are shown on the second Wednesday of every month at The Lebovic Centre for Arts & Entertainment – Nineteen on the Park (built in 1896 as Stouffville Town Hall and converted in 2009). Outside of urban Stouffville, the town operates community centres in the hamlets of Ballantrae, Lemonville, and Vandorf. The first schoolhouse in Stouffville was on Church St., just north of Main St., where the United Church building stands. In 1865, the schoolhouse was purchased by the Methodist congregation and moved across the street; the building still exists as a two-family dwelling. Today Whitchurch–Stouffville is home to several public, Catholic, and private educational institutions. The York Region District School Board has one public secondary institution in Whitchurch–Stouffville--Stouffville District Secondary School—and eight public elementary institutions: Ballantrae Public School, Glad Park Public School, Summitview Public School, Whitchurch Highlands Public School, Harry Bowes Public School, Oscar Peterson Public School, Wendat Village Public School, and Barbara Reid Public School. The York Catholic District School Board has three Catholic elementary institutions in Whitchurch–Stouffville: Saint Mark's Catholic Elementary (1965), Saint Brigid Catholic Elementary, and Saint Brendan Catholic Elementary (2012). A Kindergarten to Grade 12 Catholic French school opened in 2015. Catholic school students graduating from Grade 8 are either bused to Brother André Catholic High School in Markham, or transfer to the public system and attend Stouffville District Secondary School. Stouffville also has four private schools: The Progressive Montessori Academy, Stouffville Christian School, Mindtech Montessori School, and Willowgrove Primary School. In 2009, there were 38 licensed child care centres registered in York, but none were located in Whitchurch–Stouffville; eight child care facilities in Whitchurch–Stouffville have subsidized spaces, and four do not. As the town expands into its Phase 3 Lands (post-2015), new facilities are being planned to accommodate the increasing number of school-aged children in the community. In some areas of Stouffville, up to 50% of the children are bilingual. Both the proportion of youth participating in higher education, as well as the proportion of adults in Whitchurch–Stouffville who have completed a university program is growing annually and far exceeds the national average; 31% of adults between 25 and 64 years of age have university training; 70% have some form of post-secondary training. However, there are no post-secondary education campuses located in Whitchurch–Stouffville. In 1877, the village of Stouffville established a Mechanics' Institute, which later became the Whitchurch-Stouffville Public Library. Emmanuel Bible College in Kitchener, Ontario had its beginnings in Stouffville in 1940. In 1991 the town came close to securing an agreement with Seneca College to open a new campus in Stouffville. In 2010, the Markham Stouffville Hospital (located in Markham) became a teaching site for residents practicing family medicine at the University of Toronto Faculty of Medicine. Stouffville's economy prior to 1900 flourished because of the coming of the railway in 1871, and because of the town's location on the juncture of the Markham-Uxbridge Road and the Town Line. In 2013, Whitchurch–Stouffville had an estimated 11,249 jobs (excluding home- and farm-based businesses), 58.5% of which were full-time, 23.7% part-time, and the rest seasonal. While the manufacturing sector represented the largest number of local jobs in 2001, the actual numbers stagnated over the next decade between 1,300 and 1,600 jobs. By 2012, only 12% of local jobs were in the manufacturing sector (1,351), compared to 39% of jobs (or 4,419) in the retail and personal services sector. While the number of businesses in Whitchurch–Stouffville dropped from 750 in 2009 to 690 in 2013, the total number of local jobs went from 10,300 to 13,700. The majority of employed Whitchurch–Stouffville residents commute to Toronto and its environs for employment; in 2011 the median commuting time was 30 minutes. In the same year, the unemployment rate for Whitchurch–Stouffville was 6.3% (up from 4.8% in 2006), but below the Ontario average of 8.3%. Whitchurch–Stouffville is York Region's largest "mineral aggregate resource area;" these gravel sites and designated resource areas are located north and south of Bloomington Road, and all lie within the boundaries of the Oak Ridges Moraine. Under the Oak Ridges Moraine Conservation Act (2001), future aggregate resource operations must meet stringent review and approval standards. In 2001, 20,406 acres (8,258 hectares) of land in Whitchurch–Stouffville was dedicated to farming; 45% of the farms were between 10 and 69 acres (280,000 m2) in size; 25% focused on "other animal production," (792 horses and ponies on 50 farms) and 24% in greenhouse, nursery and floriculture production. Gross farm receipts for 2000 were $27,182,691; gross forestry receipts (once the backbone of Whitchurch Township's wealth) were $59,098. Since 2009, the town's economic development strategy has focused on small and large knowledge-based industries, agricultural and environmental services, and not-for-profit organizations. Whitchurch–Stouffville is home to two internationally respected, church-based non-governmental service organizations: Emmanuel International Canada, EMAS Canada and Christian Blind Mission – Canada (CBM), all located on Stouffville Road near Kennedy Avenue. By 2013, the town had 14,334 residential units, and projected the building of 6,525 new residential units between 2013 and 2021—and a further 1,969 units by 2031—in order to accommodate a net population increase of 17,408 new residents by 2031. In 2013 the median value of dwellings in Whitchurch–Stouffville was $471,000, or 79% higher than the provincial median of $263,500, and the town's estimated average household income was $141,885; the Ontario average was $96,1300. Only 8.8% of the private dwellings in Whitchurch–Stouffville were apartments (including duplexes) in 2011, down from 15.2% in 2006, and significantly below the provincial average was 30%. In 2009, the ratio of owned dwellings to rented dwellings in Whitchurch–Stouffville was almost 6 to 1, compared to provincial average of 2.5 to 1. In 2011, 30 per cent of renters in Whitchurch–Stouffville spent more than half their income on shelter costs, the highest in the province. Because of the high cost of housing in Whitchurch–Stouffville relative to the provincial average, 36% of Whitchurch–Stouffville businesses said in 2012 that the community was poorly positioned to attract new immigrant employees, and 45% said the same for retaining and attracting employees under 30 years of age. Nonetheless, in 2012 Stouffville residents protested zoning designations in the Town's Official Plan which called for apartments near their own neighbourhoods. Whitchurch–Stouffville has 51 units of public social housing and 124 not-for-profit units for the elderly (including a long-term care facility). In 2014, the Neighbourhoods of Cardinal Point, a community in Whitchurch–Stouffville built by Geranium Homes, was awarded Places to Grow, Community of the Year by BILDgta. Social services in Whitchurch–Stouffville include the Whitchurch–Stouffville Food Bank, located at the Churchill Community Church (Baptist) between the communities of Musselman Lake and Ballantrae, and the Care and Share Thrift Store (Mennonite Central Committee) located on Ringwood Drive in the Community of Stouffville. The YMCA also operates an employment resource centre in Stouffville. Soaring housing costs in the region have resulted in a 28% rise in Food Bank use between January 2008 and January 2010. The first organized sport in Stouffville was curling in 1890 on the Mill Pond (today site of the Latcham Art Gallery and the Mennonite Care and Share Thrift Store). Lacrosse was also played at this time, and in 1897, Stouffville won the Ontario championships. The first hockey team was organized about 1900, and at the turn of the century the Stouffville rink below Burkholder Street was considered "the largest and best arranged rink in Canada." Lawnbowling has also been played in Stouffville since the early 1900s as well as organized men's and women's baseball. The most important recreational facilities in Whitchurch–Stouffville are Soccer City, a 55,775 square feet indoor soccer complex (completed 2013); the Stouffville Clippers Sports Complex, with two NHL size ice pads (completed 2010); the Stouffville Arena, with two ice pads; the Whitchurch-Stouffville Leisure Centre, with a 25-meter pool, hot tub, gym and fitness centre, and Bethesda Park, with two ball diamonds, a senior soccer pitch and four mini sports fields (completed 2010). Whitchurch–Stouffville is home to many golf courses, including Emerald Hills, Rolling Hills, Spring Lakes, Maples of Ballantrae, Ballantrae Golf & Country Club, St. Andrews East Golf & Country Club, Timber Creek Mini Golf & Family Fun Centre, Sleepy Hollow, Meadowbrook and Station Creek. The Town has a Junior "A" ice hockey team, the Stouffville Spirit. The Stouffville Amateur Hockey League (men's and women's leagues), the Stouffville-Markham Girls Hockey Association, Whitchurch–Stouffville Minor Hockey Association, the Whitchurch–Stouffville Skating Club, and the Stouffville Adult Skating Club offer programs in the town's arenas. The Whitchurch–Stouffville Soccer Club was established in 1977 and had 1,250 members in 2010. The club uses fields at Bethesda Park, the Stouffville Arena, Bruce's Mill Conservation Area, fields owned by Teva Canada, and the Soccer City indoor facility. The Whitchurch–Stouffville Softball Association is a volunteer run house-league organization. The association uses eleven ball diamonds in town plus five in the neighbouring villages of Goodwood and Claremont. 1,142 hectares of the twenty York Regional Forest tracts (or slightly more than half of the total) are found within the borders of Whitchurch–Stouffville. The Whitchurch Conservation Area covers ten hectares, and is accessed on Aurora Sideroad, three kilometres east of Woodbine Ave. It is connected to a larger York Region Forest Tract and to trails of the Oak Ridges Trail Association. The Pangman Springs Conservation Area is accessed from Kennedy Road between Davis Drive and Aurora Road or from the Porritt tract of the York Region Forest using an Oak Ridges Trail Association side trail. Bruce's Mill Conservation Area in Whitchurch–Stouffville is the northern gateway to Rouge Park. The Master Plan for the conservation area includes not only a trail system within the park, but also future trail connections to inter-regional trails. An extensive trail system within urban Stouffville is being developed that connects to the larger forested areas of the Whitchurch–Stouffville. The most significant trail begins in town along the Stouffville Creek and leads through a mature forest around the Stouffville Reservoir. In 2012, Whitchurch–Stouffville had 32 kilometers of trails. Whitchurch–Stouffville is also home to a number of kettle lakes which are ideal for outdoor water recreation. While these glacier-formed lakes are crown property, and the resources of all levels of government are used for their regulation, protection and preservation, the actual perimeter of the lakes are in private hands (kettle lakes are not fed by creeks or rivers) and therefore only homeowners in the sub-communities have access rights to Whitchurch–Stouffville's lakes. Access to Musselman's Lake via Cedar Beach Trailer Park was lost in 2012, while access to Preston Lake was lost when Landford Development purchased the west-shore beach and trailer park and built estate properties with a shared private beach. In 2008 the town's development plans included a trail system with access to Preston Lake, but this was met with opposition from Preston Lake residents who desired to protect their exclusive access. Interest and support for the purchase or expropriation of land for public access to the town's most important natural and recreational assets has grown with the town's development. The Town of Whitchurch–Stouffville operated an outdoor public swimming pool until 2010 when it was closed due to disrepair. In 2006, the town of Whitchurch–Stouffville developed and adopted Municipal Cultural Policy as a framework for planning and delivering cultural services. Whitchurch–Stouffville's investment in the arts has been slow, and consequently residents have not only fallen below the national average on exposure to the performing arts, museums and galleries, but the average exposure has decreased from 2006 to 2010. Whitchurch–Stouffville's deficit in the performing arts has been addressed in part by the recent rehabilitation of the former Stouffville Town Hall (constructed in 1896), a redevelopment that created a multifaceted arts, culture and entertainment centre in downtown Stouffville; The Lebovic Centre for Arts & Entertainment – Nineteen on the Park opened its doors to the public in May 2009. Latcham Art Centre (formerly The Latcham Gallery) is a public art gallery established in 1979, by a group of local artists and visionaries who saw the need for an arts facility in Whitchurch–Stouffville. The art centre was named after Arthur Latcham, a local philanthropist who donated money for the building on 6240 Main Street that housed the art centre from 1979-2018. Latcham Art Centre hosts 5-6 curated exhibitions a year featuring contemporary work by provincial artists and three community exhibitions, including an annual juried exhibition, an exhibition of work by a local graduating high school art class, and an exhibition of work by students from local elementary schools. Along with exhibitions, Latcham Art Centre provides educational and public programs including school visits, public lectures, art workshops and classes, and tours led by the curator, art educators and exhibiting artists. Admission to Latcham Art Centre is free. The art centre is a member of the Ontario Association of Art Galleries and its operations are supported by the Town of Whitchurch–Stouffville and the Ontario Arts Council. In August 2018, Latcham Art Centre moved from 6240 Main Street to the Whitchurch-Stouffville Leisure Centre, changing its name from The Latcham Gallery to Latcham Art Centre. Since 2000, artists in Whitchurch–Stouffville have organized the Whitchurch-Stouffville Studio Tour, featuring more than two dozen artists in several venues across Whitchurch–Stouffville. The Studio Tour takes place the weekend after Thanksgiving each year. In 2008, the Tour was nominated for "The Premier's award for excellence in art." The Whitchurch-Stouffville Public Library is located in the Whitchurch-Stouffvile Leisure Centre (constructed in 2001), a facility occupied jointly by the department of Leisure Services and the library. The population served by the library doubled between 2005 and 2013, and circulation increased 109%. Library expenditures dropped from 5.1% of town operating expenses in 2004 to 3.0% in 2007, and 2.7% in the 2014 budget. In 2014, Whitchurch–Stouffville's per capita library costs were $26, the lowest of twenty-four Ontario towns in its population category (median $42). In 2010, the Maclean's "Third Annual Smart Cities Rankings" showed that for residents in Whitchurch–Stouffville, "exposure to reading" had declined annually from 2006 to 2010, and fell significantly below the national average. A library expansion was first projected for 2009. In June 2011 local book clubs and individuals began a grass-roots campaign to petition for greater municipal funding for the public library. In 2012, the Town commissioned a study of the library's current and future space needs. A 2014 expansion design was rejected by the newly elected Town Council in 2015, and the minimum space requirements for a community library were vigorously challenged. The Stouffville Strawberry Festival is a traditional community fair on the Canada Day weekend, which celebrates Stouffville's agricultural heritage. The Markham Fair is hosted by the Markham and East York Agricultural Society, and supported by both the City of Markham and the Town of Whitchurch–Stouffville (Stouffville south of Main Street was part of Markham Township prior to 1971). The Markham Fair dates back to 1844 and is one of Canada's oldest and largest fairs, hosting upwards of 80,000 visitors. The fair is held on the weekend before Thanksgiving. It is held at the Markham fairgrounds, directly south of the Stouffville town border. Bruce's Mill Conservation Area hosts an annual Sugarbush Maple Syrup Festival over four weeks in March and April. In February the Musselman Lake community hosts an annual Winter Carnival at Cedar Beach. York Region's Spring Forest Festival is held annually during Earth Week (April) in the York Regional Forest, Eldred King Tract, Highway 48 (just south of Vivian Road). The annual Wine and Food Festival (June) is organized by the Ballantrae Golf and Country Club. In September Stouffville hosts a Weekend of Music and Peace; the Peace Festival coincides with the United Nations International Day of Peace (September 21). The idea for the Whitchurch–Stouffville Museum began in 1969 as a civic-minded project by a group of local residents. After opening in 1971 in the hamlet of Vandorf the site has grown over the years from the original museum building. The museum site includes five historic structures from the former Township of Whitchurch: the Bogarttown Schoolhouse (1857), a pioneer log cabin (c. 1850), a Victorian Farmhouse built by James Brown (1857), a barn (c. 1830) and Vandorf Public School (1870). In 2012, the Whitchurch–Stouffville Museum added a Community Centre that blended the old with the new by joining the two schoolhouses. The new facility includes a Research Room, Exhibition Gallery, Discovery Room, and two rental spaces. The town is currently served by two local community newspapers: the Stouffville Free Press and the Stouffville Sun-Tribune. SNAP Stouffville/Uxbridge is a print publication which specializes in a photographic view of life in the community. Stouffville Connects is an online publication focussed on community contributed journalism. A community radio station, WhiStle Radio (CIWS-FM), was launched in 2008. Movies partially shot on location in the community of Stouffville include: The Russell Girl (2008), Stir of Echoes: The Homecoming (2007), Who Killed Atlanta's Children? (2000), On Hostile Ground (2000), Strike! (1998), The Sweet Hereafter (1997), Bad Day on the Block (1997), Martin's Day (1984), and The Dead Zone (1983). Television shows shot in Stouffville include episodes from Warehouse 13 (2010), The West Wing, Degrassi: The Next Generation, Nikita, Schitt's Creek (2015), and Curse of the Axe (documentary film on the Wendat-Huron village site discovered in Stouffville). Films and television shows shot at Shadow Lake Centre in Whitchurch–Stouffville (Musselman Lake) include 1-8oo-Missing, Tarzan & Jane, The Crossing, Run the Wild Fields, Ice Men, Top Cops, The Loretta Claiborne Story, True Romance, Ready or Not, and The White Dog Sacrifice. and The Littlest Hobo (Summitview Public School). Bruce's Mill Conservation Area, the northern gateway to Rouge Park with trails, and Community Safety Village. Underhill, Frank – Founder of the Co-operative Commonwealth Federation (CCF) Party; co-writer of the Regina Manifesto (1933) and Officer of the Order of Canada. ^ "Final Summary of Election Results" (PDF). Town of Whitchurch-Stouffville. Retrieved 2018-11-19. ^ a b c "Whitchurch-Stouffville, Town Ontario (Census Subdivision)". Census Profile. Statistics Canada. 2012-02-08. Retrieved 2012-02-08. ^ Statistics Canada, 2006 Census Profile, Town of Whitchurch-Stouffville. ^ Tracy Kibble, "Sell Stouffville in '93: EDAC," 'Stouffville Tribune', Jan. 27, 1993, p. 3. ^ a b A Brief History of Whitchurch-Stouffville, Town of Whitchurch-Stouffville. ^ 2016 Census Profile, Town of Whitchurch-Stouffville; in 2006/07 the Region projected a population of 38,000 for 2021, which however was reached in 2011 (cf. York Regional Transit, "VIVA NEXT," (2006/07), Table 4.1). ^ Compare Statistics Canada, 2001 Census community highlights for Whitchurch-Stouffville., with Census Profile 2016, Whitchurch-Stouffville, Ontario." ^ Cf. Town of Whitchurch-Stouffville, Growth Strategy Management Strategy. ^ Ontario Ministry of Municipal Affairs and Housing, Oak Ridges Morain Conservation Plan; Greenbelt Protection; Ontario Ministry of Energy and Infrastructure, Places to Grow Act, 2005. ^ Town of Whitchurch-Stouffville, Growth Management Strategy; also York Region Official Plan, Map: Environmentally Significant Areas and Life Science Areas of Natural and Scientific Interest (December 2009). ^ Cf. Boundary Map, Town of Whitchurch-Stouffville, official website. For a detailed history of these unique communities, see Jean Barkey et al., Whitchurch Township (Erin, ON: Boston Mills, 1993). ^ Barkey et al., Whitchurch Township, 118f. ; for a very descriptive account of ancient native burial grounds in Whitchurch Township written in 188, cf. C. Mulvany et al., History of Toronto and County of York, Ontario (Toronto: C. Blackett Robinson, 1885), 148–151. ^ Barkey et al., Whitchurch Township, ch. 1, pp. 9ff., 18. Cf. also C.P. Mulvany, et al., Whitchurch, History of Toronto and County of York, Ontario (Toronto: C.B. Robinson, 1885), 148ff. ; cf. 1718 map by [Guillaume de L'Isle], Carte de la Louisiane et du Cours du Mississipi, with trail from Lake Ontario to Lake Simcoe clearly indicated. ^ Cf. A Brief History of Preston LakePride and Preston Lake website). ^ Barkey et al., Whitchurch Township, 124f. ^ The Community of Musselman's Lake: A Little History, Musselman's Lake Residents Association (MLRA) official website. ^ Archeological Services, Inc., Mantle Site; Jennifer Birch, Coalescent Communities Iroquoian Ontario, PhD Dissertation, Dept. of Anthropology, McMaster University, 2010; Toronto Museum Project, Dunsmere Pipe; also Minutes, Town of Whitchurch-Stouffville Council, Huron Ancestral Village Resolution (C10-C0 & R00), June 17, 2007. ^ "Curse of the Axe on History," Northernstars.ca, the Canadian Movie Database, July 6, 2012; also Patrick Cain, "Vanished Huron village in Whitchurch-Stouffville held baffling mystery," Global News, July 6, 2012. ^ Indian and Northern Affairs Canada, The Williams Treaties, 1923. ^ Cf. Barkey et al., Whitchurch Township, 14. ^ Wm. H. Smith, Whitchurch, Canadian Gazetteer (Toronto: Roswell, 1849), 212. ^ a b Barkey et al., Whitchurch Township, 14. ^ See Barkey, et al., Whitchurch Township, 19f. ^ History of Toronto and County of York, Ontario, vol. 2 (1885), 462. ^ For a detailed account, see Jean Barkey, Stouffville, 1877–1977: A Pictorial History of a Prosperous Ontario Community (Stouffville, ON: Stouffville Historical Committee, 1977), 2ff. ^ (Whitchurch Township, 34; also Isabel Champion, ed., Markham: 1793–1900 (Markham, ON: Markham Historical Society, 1979), 289–296. For a detailed description of pioneer life, cf. L. Henry and G.C. Paterson, Pioneer Days in Ontario (Toronto: Ryerson, 1938). ^ Barkey et al., Whitchurch Township, 18. ^ Whitchurch-Stouffville Public Library, Stouffville Walking Tour No. 1. ^ Barkey et al., Whitchurch Township, 96. ^ C. Fothergill, ed., Mackenzie's Own Narrative of the Late Rebellion (Ottawa: Golden Dog, 1980), 5; J.C. Dent, The Story of the Upper Canada Rebellion, vol. 2 (Toronto: 1885), 218; D.B. Read, The Canadian rebellion of 1837 (Toronto, 1896), 293. ^ Stouffville, Canadian Gazetteer (Toronto: Roswell, 1849), 177. ^ Cf. Barkey et al., Appendix A: Churches, Whitchurch-Township, 126ff. Also C.P. Mulvany, et al., Stouffville, History of Toronto and County of York, Ontario (Toronto: C.B. Robinson, 1885), 202. Mulvany (p. 152) notes that Whitchurch Township, without the Village of Stouffville, had a population of 4,529 in 1881. Cf. also The Ecclesiastical Gazette, (London, 1869), 318;The Congregational Quarterly, Vol. 11 (1869):140; A Historical and Statistical Report of the Presbyterian Church of Canada (Montreal, 1866), 36; Altona Mennonite Meetinghouse (Stouffville), Global Anabaptist Mennonite Encyclopedia Online; see esp. Barkey, Stouffville, 1877–1977, 138–151, 7. ^ McEvoy, The Province of Ontario Gazetteer and Directory, 1869. ^ J. A. Crawford, Gazetteer and Directory of the County of Ontario, for the year 1876 (Uxbridge, ON: 1876), 14. ^ Cf. 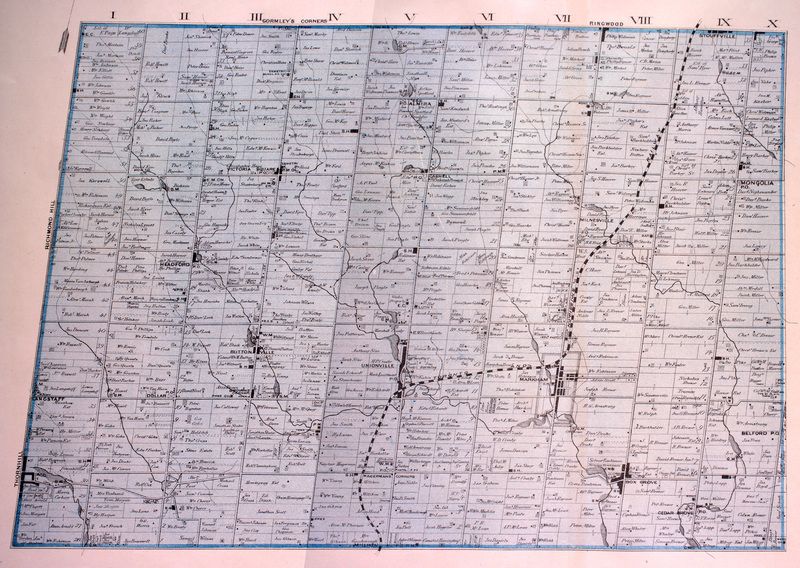 the detailed 1878 maps, Township of Markham; Township of Whitchurch, Illustrated historical atlas of the county of York and the township of West Gwillimbury & town of Bradford in the county of Simcoe, Ont. (Toronto : Miles & Co., 1878); also Stouffville Map (1880). ^ Barkey, Stouffville, 1877–1977, 19. ^ History of Toronto and County of York, Ontario, vol. 2 (1885), 453. 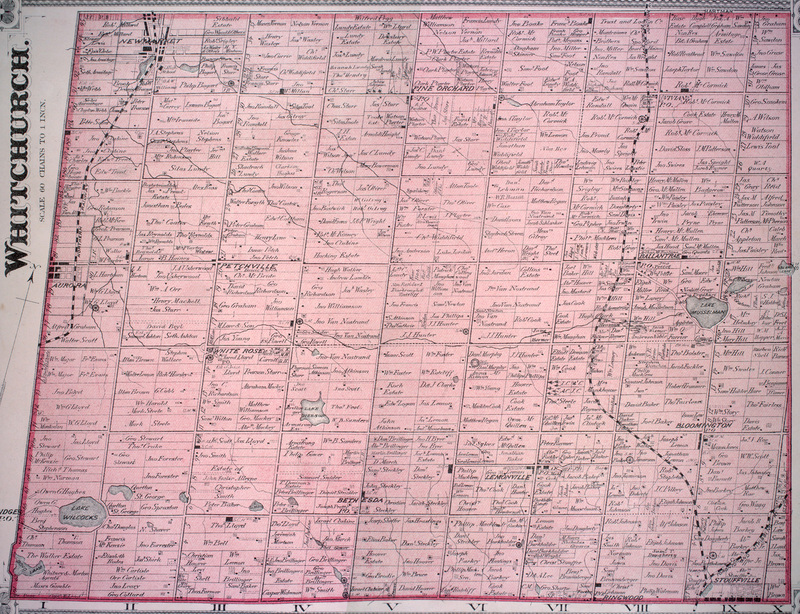 ^ Province of Ontario Gazetteer and Directory: Stouffville (Ingersoll, ON, 1911), 995. ^ Cf. Barkey et al., Whitchurch Township, 18–19, 21; 28f. ^ Barkey et al., Whitchurch Township, 92. ^ Town of Whitchurch-Stouffville, Annual Report 2008, 6. ^ York Regional Forest, York Region official website. ^ Toronto and Area Conservation Authority, Rouge River Watershed Plan (2007), 64, 78. ^ Barkey et al., Whitchurch Township, 33; see also 30f. ^ Barkey et al., Whitchurch Township, 99. ^ Cf. Barkey et al., Whitchurch Township, 99. ^ New Scientist, Birth Defects Mystery (July 18, 1981), 137; The Sorry Saga of Stouffville's Polluted Water (Mar 18, 1982), 700; Legislative Assembly of Ontario, Proceedings, April 6, 1982; H. Rosenberg, The Kitchen and the Multinational Corporation: An analysis of the links between the household and global corporations, Journal of Business Ethics 6 (1987), 179f. ; Globe and Mail (May 12, 1982). ^ Cf. Legislative Assembly of Ontario, Proceedings, (April 6, 1982); Proceedings (January 18, 1983). The garbage disposal company made a substantial donation to the governing Progressive Conservative party in 1974 as it was seeking disposal permits (cf. John Swaigan, How to Fight for What's Right (James Lorimer & Company, 1981), 8f.). ^ Cf. Ministry of the Environment, Whitchurch-Stouffville Mutagenicity Study: Final Report (1982), 46–47; also the Legislative Assembly of Ontario, Proceedings: Stouffville Dump (June 18, 1984). ^ Warren Smith, Ballantrae Golf and Country Club – Not always thus .... Between 2001 and 2006, Ballantrae's population mushroomed from a population 295 to 1,278 people (Statistics Canada, Population and dwelling counts, for urban areas, 2006 and 2001). ^ York Region, Water and Wastewater Masterplan (November 2009); Amendment 6 to the Official Plan for the Regional Municipality of York (1998). ^ Cf. Transport Canada, Press Release, June 11, 2013; Plan Showing Pickering Airport Site; also Greater Toronto Airports Authority, Pickering Airport Draft Plan Report, 6.3. By comparison, Toronto Pearson International Airport had 32.3 million passengers in 2008, with an average of 1,179 "aircraft movements" per day (GTTA, Toronto Pearson Fast Facts. ^ See GTAA, "Needs Assessment Study Pickering Lands: Final Report," March 2011, fig. 12.1 & par. 12.4.3; also Transport Canada, News Release: "Transport Canada releases findings of the 2010 Pickering Lands Needs Assessment Study," July 11, 2011; S. Bolan, "Stouffville politicians mixed over airport plan," Stouffville Sun-Tribune, July 13, 2011. ^ M. Kennedy (Town Clerk) and Robert J. Williams, Town of Whitchurch-Stouffville Electoral Ward Review Policy: Final Report, May 2009. ^ a b "Final Summary of Election Results" (PDF). whitchurch.civicweb.net. October 24, 2018. Retrieved November 19, 2018. ^ School Board Trustee Information, Town of Whitchurch-Stouffville official website. ^ DPRA Canada, Town of Whitchurch-Stouffville Community Satisfaction Survey (May 27, 2008), 7f. ^ DPRA Canada, Town of Whitchurch-Stouffville Media Release, Community Satisfaction Survey, (June 3, 2008), 8. ^ Lake Simcoe Region Conservation Authority/ Town of Whitchurch-Stouffville, Musselman's Lake Subwatershed: Assessment and Stewardship Opportunities Report (2009), 115–117. ^ S. Bolan, "Customer King at New Stouffville Town Hall," Stouffville Sun-Tribune, June 16, 2011. ^ Federal Electoral Boundaries Commission of Ontario, Markham—Stouffville – Commission's Report, 2013. ^ Ontario Ministry of Municipal Affairs and Housing, Land Use Planning: The Oak Ridges Moraine (Map). ^ For the following, see Barkey, et al., Whitchurch Township, ch. 6. ^ York Region, Official Plan: Oak Ridges Moraine Aquifer Vulnerability Areas and Watershed Boundaries, Map 7. ^ Cf. Toronto and Region Conservation Authority, Rouge River Watershed Plan Report: Towards a Healthy and Sustainable Future (2007); Rouge River State of the Watershed Report: Study Area and Physical Setting (2007). ^ For more detail, see Ontario Ministry of Natural Resources, Ontario Tree Atlas: Ecodistrict 6E-7. ^ York Region, 2013 Greening Strategy Achievements, Table 2, p. 5; for an exhaustive list of flora and fauna in the Town of Whitchurch-Stouffville, see: Community of Stouffville Secondary Plan Amendment, Phase 3 Land. Natural Environment Background Report, Appendix II: Wildlife Species Lists, November 2013. ^ Toronto and Region Conservation Authority, CTC Source Protection Region: Updated Assessment Report – Toronto and Region Source Protection, Vol. 1, Report, pp. 2–29; 4–26; Fig. 4.21, 4.22, 4.23; Table 5.6; 5.12; Fig. 5.24, 5.25. See also: Vol. 2, Appendixes, July 2011. ^ "Stouffville WPCP". Canadian Climate Normals 1971–2000. Environment Canada. Retrieved 2016-05-12. ^ Ontario Ministry of Natural Resources, Climate Change in Ontario: Interactive Map. ^ Secretariat of the Commission for Environmental Cooperation, Long-Range Transport of Ground-Level Ozone and Its Precursors (Montreal, 1997), 20; eight-hour exposure to ozone concentrations of 85 to 104 ppb are described as "unhealthy" for sensitive groups. ^ Jasmeet Sidhu, GTA gets year's first smog advisory, Toronto Star, May 21, 2009. ^ Statistics Canada, 2011 Census, Whitchurch-Stouffville; Town of Whitchurch-Stouffville,Business Plan, Operating and Capital Budgets 2015 Draft," Jan. 20, 2015, p. 15. ^ "2011 Community Profiles". Statistics Canada. ^ Statistics Canada, 2011 Census Community Profile for Whitchurch-Stouffville. ^ Toronto Star, Whitchurch-Stouffville Growth, and 2011 Canada Census, Feb. 8, 2012. ^ Statistics Canada, National Household Survey, Whitchurch-Stouffville, Ontario; Highlights for Whitchurch-Stouffville, 1991 & 1996; 2001 Community Highlights for Whitchurch-Stouffville; Community Profiles: Stouffville; also S. Bolan, Stouffville residents sound off on leisure, Stouffville Sun-Tribune (online), May 26, 2010. ^ Education Quality and Accountability Office, School Report 2012–13: Oscar Peterson Public School, p. 17. ^ a b Canadian Council on Learning, Composite Learning Index 2010 Profile: Whitchurch-Stouffville, Macleans May 31, 2010. ^ Canada, Government of Canada, Statistics. "Statistics Canada: 2011 Census Profile". ^ Cf. GO Transit Richmond Hill Line Notification Letters, 2009. ^ York-Durham Heritage Railroad, official website. ^ Cf. the YRT's maps and the York Region Transit-Viva Annual Service Plan 2012, slide 30 of 38. For the history and ridership of these routes, see the Canadian Public Transit Discussion Board, Route 9 and Route 15; also see York Region's Moving on Sustainability Transportation Master Plan Update, Main Report (Nov. 2009). ^ See S. Bolan, "Get on board Stouffville-Yonge St. YRT route next month," Stouffville Sun-Tribune, Jan. 8, 2014; also: Newsroom—Province of Ontario, "Commuter train and bus station to be completed by end of 2016," Dec. 1, 2014. ^ Cf. GO Transit's Stouffville Schedule. ^ Cf. Statistics Canada, 2010 Statistics Canada National Household Survey profile for Whitchurch-Stouffville; also 2006 Statistics Canada Community Profile for Stouffville. ^ Province of Ontario, Improving Access to Health Care Services in York Region; Markham-Stouffville Hospital, Expansion: We're Growing, Official Website; "About the Foundation." ^ Aphasia Centre, official website; "Stouffville's Aphasia Centre has Plenty to Celebrate", Stouffville Sun-Tribune, Oct. 17, 2014. ^ 21 Officers will work out of new Stouffville police station, Stouffville Sun-Tribune, January 23, 2014; also York Regional Police, Whitchurch-Stouffville Community Sub-Station (official website). ^ Town of Whitchurch-Stouffville, Stouffville Sun-Tribune, Aug. 19, 2010, p. 4 (print version only). See also "Canada's Most Dangerous Cities," Macleans, October 14, 2010, which ranks York Region 95 out 100 (i.e., fifth safest place in Canada). ^ Cf. Leigh Beihl, "Shopping Main St. Stouffville," Stouffville Sun-Tribune, Aug. 10, 2008. ^ Barkey, Stouffville, 1877–1977, 116 (with picture), 140; also Barkey et al., Whitchurch Township, 96. ^ Bolan, Sandra (2015-09-02). "Stouffville's first French school ready for opening week". YorkRegion.com. Retrieved 2018-04-15. ^ The Progressive Montessori Academy, official website. ^ Stouffville Christian School, official website. ^ York University, Infrastructure in York Region: Human Resources Analysis, (June 30, 2009), 46. ^ The Catholic School Board identified the need for one high school, and the public board will require two additional elementary schools. Cf. Town of Whitchurch-Stouffville, Council in Committee Report, Growth Management Implementation, December 3, 2013, p. 6. ^ Cf. York Region District School Board, School Report: Oscar Peterson Public School, 2013–2014, Grade 6, p. 9. ^ Statistics Canada, National Household Survey – Whitchurch-Stouffville, 2013. ^ E.R. Storms, Emmanuel Bible College (1956), Global Anabaptist Mennonite Encycledia Online. ^ Phil Johnson, Whitchurch-Stouffville vies for new campus, Toronto Star, Nov. 28, 1991. ^ Cf. Looking for a Family Physician? Partnership with UofT will Produce Benefits for our Community, Messenger: Markham-Stouffville Hospital Foundation, (Winter 2009). ^ For a detailed history of Stouffville's early economy activity, see Champion, ed., Markham: 1793–1900, 289–296. ^ York Region, Employment and Industry Report 2013, 34–36. ^ York Region, Employment and Industry Report 2013, p. 34; compare with Employment and Industry Report 2009, Table 36. ^ Statistics Canada, National Household Survey: Whitchurch-Stouffville, Ontario, 2013; National Household Survey: Ontario, 2013. ^ Cf. Town of Whitchurch-Stouffville, Annual Report 2009, 2; also S. Bolan, "100 Jobs Created Last Year in Stouffville, Stouffville Sun Tribune (Jun 17, 2011). ^ Cf. "Jobs, expansion coming to Stouffville drug plant," Stouffville Sun-Tribune, July 14, 2011. ^ York Region Official Plan, Map: Mineral Aggregate Resource Areas (December 2009). ^ Ontario Ministry of Municipal Affairs and Housing,Oak Ridges Moraine Conservation Plan: Land Use Planning. ^ Statistics Canada, Table 5 – Land Use, and Table 4, Table 2, Table 22 – Other Livestock, Table 33 – Gross Farm Receipts 2001. ^ Town of Whitchurch-Stouffville, Economic Development Strategy: Final Report, Dec. 2, 2008. ^ Emmanuel International Canada, official website; and CBM (Christian Blind Mission Canada, official website. ^ BMA Municipal Study 2013, p. 400. Cf. also 2008 to 2012 Municipal Property Assessment Corporation statistics compared with other York Region municipalities: S. Bolan, "Stouffville property values up 17 per cent," Stouffville Sun-Tribune, Oct. 23, 2012. ^ BMA Municipal Study 2013, pp. 26, 401. ^ Statistics Canada, Community Profile: Whitchurch-Stouffville, 2012; see also York Region, Taking Stock: An Overview of the Housing System in York Region (2012). ^ Town of Whitchurch-Stouffville, "Community of Stouffville Phase Two Development Lands: Background and Options Report," (Sept. 2009), 11. ^ T. McMahon, "Affordable Housing crisis affects one in five renters in Canada," Globe and Mail, Sept. 10, 2015. ^ "King and Whitchurch-Stouffville Cultivating Business Report" (June 2012). ^ Sandra Bolan, Stouffville Neighbours down on apartment building, Stouffville Sun-Tribune (Sept. 7, 2012). See also Town of Whitchurch-Stouffville, Residential Subdivision/Condominium Activity Map, July 2012. ^ Town of Whitchurch-Stouffville, "Community of Stouffville Phase Two Development Lands: Background and Options Report," (Sept. 2009), 14; cf. also York Support Services Network, Housing Options Program. ^ "Winners Announced for the 34th Annual BILD Awards - Urban Toronto". ^ Whitchurch-Stouffville Food Bank, York Region Food Network; Care and Share Thrift Shop. ^ Editorial, Soaring housing market not good for everyone, Stouffville Sun-Tribune, March 25, 2010; also York Region Food Network, 2009 Report on Hunger, 2. ^ Barkey, Stouffville, 1877–1977: A Pictorial History, 172, 175. ^ Barkey, Stouffville, 1877–1977: A Pictorial History, 180, 184, 188. ^ Cf. "Leisure," Leisure Strategy Update 2013, Town of Whitchurch-Stouffville, official website. ^ Stouffville Spirit official website. ^ Town of Whitchurch-Stouffville, Skating, official website. ^ Whitchurch-Stouffville Soccer Club, official website. ^ Whitchurch-Stouffville Softball Association, official website. ^ York Regional Forest Management Plan 1998–2018, March 2010. ^ Whitchurch Conservation Area, Lake Simcoe Region Conservation Authority, official website. ^ Pangman Springs Conservation Area, official website. ^ Bruce's Mill Conservation Area, Toronto and Region Conservation Authority, official website. ^ See the Town of Whitchurch-Stouffville's map of Existing and Future Trails—Stouffville and a description of the Stouffville Town trail; see also York Region's Take a Hike Trail Guide, Recreational Trails Guide and the York Region 2011 Cycling Map. ^ Town of Whitchurch-Stouffville, "[Annual Report 2012]." ^ Cf. Sandra Bolan, "Stouffville beach closed to public," Sun-Tribune, June 7, 2012; also the Musselman's Lake Residents Association website. ^ The Vandorf-Preston Lake Secondary plan which proposed a trail system that would give public access to the lake met with opposition; cf. H. Volpe, Little growth but some concerns for Vandorf area, Sun-Tribune, Feb. 22, 2008; Town of Whitchurch-Stouffville, Council Public Hearing Minutes, Feb. 19, 2008. Fishermen are also unhappy: cf. Ontario Fishing Forum, Preston Lake Access; see also letters to local papers in 2010 (e.g., Last Chance for Lakeside Park, Mar 5, 2010). ^ Town of Whitchurch-Stouffville, "Municipal Cultural Policy," June 2006; Leisure Services Master Plan Update, 2011, p. xii. ^ The Lebovic Centre for Arts & Entertainment – Nineteen on the Park, official website. ^ "History | The Latcham Gallery". www.latchamartcentre.ca. Retrieved 2018-08-29. ^ "Hours | The Latcham Gallery". www.latchamartcentre.ca. Retrieved 2018-08-29. ^ Latcham Gallery, official website; see also Gallery, Stouffville.com, and Latcham Gallery Association Online Exhibit, StouffvilleConnects.com. ^ "Latcham Art Centre Hosts Grand Opening". www.stouffville.com. Retrieved 2018-08-29. ^ "The Stouffville Studio Tour and Sale". Stouffville Studio Tour. Archived from the original on 4 October 2009. Retrieved 16 October 2018. ^ Ontario Ministry of Tourism, Culture and Sport, Public Library Statistics, 1999-2013. ^ See BMA Municipal Study 2014, 215; also Town of Whitchurch-Stouffville, Annual Financial Statements; Annual Report 2004, 7; 2015 Business Plan, Operating and Capital Budgets, 5; see also Whitchurch-Stouffville Public Library, Strategic Plan 2013-2016; Town of Whitchurch-Stouffville, Town Council Approves 2011 Budget, Feb. 23, 2011; BMA Municipal Study 2010, 124. ^ Canadian Council on Learning, Composite Learning Index 2010 Profile: Whitchurch-Stouffville; How Smart is Your City? Macleans May 31, 2010; see also Data Angel,Literacy Report Card for Census Subdivision of Whitchurch-Stouffville, 2010. ^ Hannelore Volpe, "Growing Pains for Stouffville?" Stouffville Sun-Tribune, Feb. 7, 2007. ^ Whitchurch-Stouffville Library Petition, June 2011. ^ dmA Planning and Management Services, Whitchurch-Stouffville Public Library: Current and Future Space Requirements. 2012 Update, Final Report (May 2012). ^ Whitchurch-Stouffville Library Board, Minutes: Special Meeting, April 13, 2015. ^ Stouffville Strawberry Festival, official website. ^ Markham Fair, official website. ^ Toronto and Region Conservation Authority, Sugarbush Maple Syrop Festival: Bruce's Mill, official website. ^ Whitchurch-Stouffville Museum, Official website. ^ Cf. Stouffville Free Press, official website; Stouffville Sun-Tribune, official website (1888–2007 archived issues available at OurOntario.ca Community Newspapers Collection); SNAP Stouffville/Uxbridge, official website; and Stouffville Connects, official website. ^ WhiStle Radio, official website. ^ "Stouffville subs in for South Dakota town in TV shoot". yorkregion.com. Retrieved 12 November 2015. ^ West Wing Episode Guide, Opposition Research. ^ Stouffville Sun-Tribune, Stouffville subs in for South Dakota town in TV shoot (March 31, 2010). ^ Stouffville Sun-Tribune, Schitt's Creek fans get up close with TV stars in Stouffville (June 3, 2015). ^ See Patrick Cain (with movie trailer), "Vanished Huron village in Whitchurch-Stouffville held baffling mystery," Global News (July 6, 2012); also "Curse of the Axe on History," Northernstars.ca, the Canadian Movie Database, July 6, 2012. ^ "Empire State Building Tombstone In The Aurora Cemetery, John W. Bowser - Living in Aurora, Town of Aurora, Ontario - Living In Aurora Ontario Canada". livinginaurora.ca. ^ Michael Hayakawa, "25 Games: NHL Suspendes Torres," Stouffville Sun-Tribune (www.YorkRegion.com), April 21, 2012. ^ Stouffville-Igoma Partnership (SIP), official website. Wikimedia Commons has media related to Whitchurch–Stouffville.